There are many different types of joints in the human body. Some are more fixated while others tend to have higher mobility. This of course comes at a cost as the joint with higher degrees of mobility can also experience more traumatic injuries. The shoulder joint is one such highly mobile joint that often times experiences various injuries from falling, sport related activities, or from repeated motions. The shoulder is classified as a ball-and-socket joint with almost a full 360 degrees in a plane of motion. To support this joint, it is encapsulated in a fibrous band of connective tissue and deepened with a ring of connective tissue known as a labrum. The joint is then stabilized further by a system of four muscles that also are the basis for movement called a rotator cuff (Supraspinatus, Infraspinatus, Teres Minor, and Subscapularis). 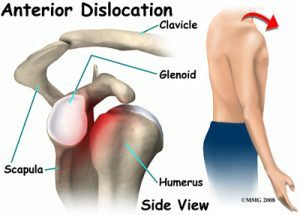 When there is an excessive amount of force applied, the shoulder becomes displaced causing a dislocation either forwards or backwards that requires medical attention. This article aims to give insight on the three types of shoulder dislocations, treatment approach, and prognosis. Anterior Shoulder Dislocation: This type of shoulder injury is whenever a blunt traumatic force is directed from behind the joint itself or from falling on an outstretched arm. This injury is usually the most common experienced resulting into upwards of 95% of shoulder dislocations. Determination is performed via X-ray diagnostics and presents with the individual holding their shoulder slightly away from their body. Posterior Shoulder Dislocation: When a force is applied to the frontal aspect of shoulder, the ‘ball’ of the socket has a high chance to become displaced posteriorly. This type of dislocation is less common than an anterior dislocation, but can be more severe due to becoming lodged behind a bony prominence of the shoulder blade. This type of dislocation is usually the most common in the elderly. 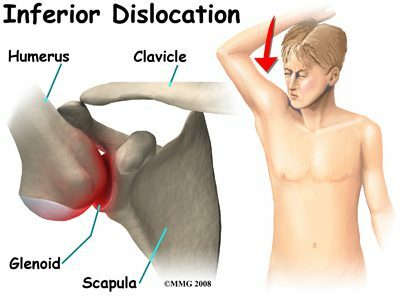 Inferior Shoulder Dislocation: This type of dislocation is the least common of the various types. In this dislocation the joint is directed downward while the arm is rapidly forced upward. An example of this is falling from a height while the arm hits and object forcing it upward. While the least likely, this type of dislocation can be further complicated by compression of nerves and numerous blood vessels in the area. 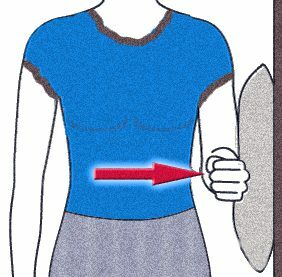 Isometric pushes: Standing at a wall, place a soft pillow against the wall with your injured arm holding it in place. Your injured arm should be resting at your side with your elbow bent to 90 degrees. Push into the pillow with 50% intensity holding for 3 seconds, rest, repeat. Scapular Squeezes: While standing or sitting, squeeze your shoulder blades together as if rowing a boat. Let your arms either hang at your side or have your elbows bent to 90 degrees simulating rowing a boat. Hold each squeeze for 3 seconds, rest, repeat. At Hampton Physical Therapy we apply the latest in research-based interventions to get patients back to their previous level of function in the shortest amount of time. We create rehab goals based on the patient’s interests/desires while improving on your ability to return to those activities. We have two locations in both Hampton and Seabrook to provide you with a level of care and service needed to get you back where you want to be. If you still have questions feel free to call either location or sign up for a FREE Discovery Visit and speak with a therapist to learn how physical therapy can help you. 2. Edmiston, Julie PA-C , RT. 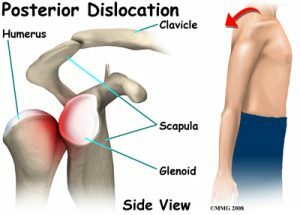 Distinguishing three types of shoulder dislocations. Journal of the American Academy of PAs. May 2013. 26:5. p 60, 62-63. Wishing All a Joyful Holiday Season! Dizziness & Vertigo ~ PT Can Help! Are Shin Splints Wrecking Your Run? How Stretching Will Improve Your Life! Ankle Sprains: How Physical Therapy Can Help! Do You Have Noisy Joints? Have a Pain in Your Head? Becoming a Physical Therapist is a GREAT Choice! ‘PLANK TIL YOU TANK’ Winners! The Age Old Question ~ Heat or Ice? Plantar Fasciitis Are You at Risk? Is Your Child’s Backpack an Injury Risk? What Brand of Footwear is best? Thank you for your message and/or testimonial, we will be in touch very shortly if you posed a question. Want to ask our Physical Therapist a question or share a testimonial? Simply fill out the form below! Hours of Operation: Monday-Thursday 7 a.m.-7 p.m. / Friday 7 a.m - 6 p.m.
© 2019 Hampton Physical Therapy.